The Congressional Black Caucus Foundation held its Annual Legislative Conference at the Walter E. Washington Convention Center to bring awareness to issues impacting African-Americans and the global black community. 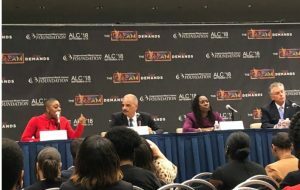 Rep. Marcia Fudge (D-Ohio), former Attorney General Eric Holder, President and Direct-Counsel of the NAACP Legal Defense and Educational Fund Sherrilyn Ifill and former Gov. Terry McAuliffe (D-Va.) sat down to discuss the state of voting rights and the disenfranchisement of minorities. Since the 2016 election, Democrats have been emphasizing the importance of voter turnout in the midterm election. “Nov. 6 is not just Election Day; it is judgement day,” said Ifill. This rings true for Democrats who are looking to gain seats in Congress in November. “Voting rights are under siege in this country,” says McAuliffe, who is known for restoring the voting rights of over 150,000 convicted felons in Virginia. This was apparent in Georgia where an election board made plans to shut down 7 of 9 polling stations in Randolph County, a rural area comprised of 61 percent African-Americans. This came after Stacey Abrams (D-Ga.) won the Democratic gubernatorial primary election. Though the plan was shot down, this is an example of several attempts around the country to silence voters. Minority communities are traditionally undercounted in the census, but the count is very important to many of the issues impacting these groups. The census count determines a number of things including the amount of federal aid allocated, how many state representatives there are and the redrawing of district lines. An undercount and a low voter turnout can lead to disproportionate amounts of power among certain political parties. After every census, state legislatures redraw district lines, which often leads to gerrymandering and lack of representation of certain communities. The panel stressed the importance of paying attention to state and local elections because many of the issues voters are concerned about are impacted by the state legislatures, but many voters overlook these elections. The 2018 midterm elections are on Nov. 6. If you are unsure about if you are registered to vote, how to get an absentee ballot, or where your polling location is, visit vote.org.